Their client wanted a garden that was dog-friendly yet didn’t require lots of maintenance, and would use the natural slope of the garden to maximum effect. She was also keen to have a number of different seating areas around the garden, meaning the garden had to be visually exciting from every angle. Bordered on three sides by timber fencing, the garden also needed to work with the modern style of the house while still having a homely, friendly touch. Working around the existing 12ft conservatory and with the rectangular garden, Landmark created a unique design mixing natural and manmade materials, traditional and modern touches, and angular and softer shapes. They used a series of planters built from richly-coloured wooden sleepers to border the garden, split across a variety of levels to work with the slope of the garden. The same sleepers were used to create a surround for the central turfed area (where artificial turf was used for low maintenance) and the ultra-modern water feature. Staggered planting heights and textures were used to contrast with the clean, crisp lines of the sleepers and patio paving. The surrounding planters were arranged symmetrically, maintaining a classic profile for the garden – especially when accompanied by the rustic wheelbarrow! Landmark used our Arctic Granite paving across the main patio area, utility space at the side of the house, and around the split floor levels of the garden. By using all three colours of the granite – Glacier, Dusk and Midnight – the team were able to create striking contrasts between each of the paved levels, giving the garden a very modern twist. 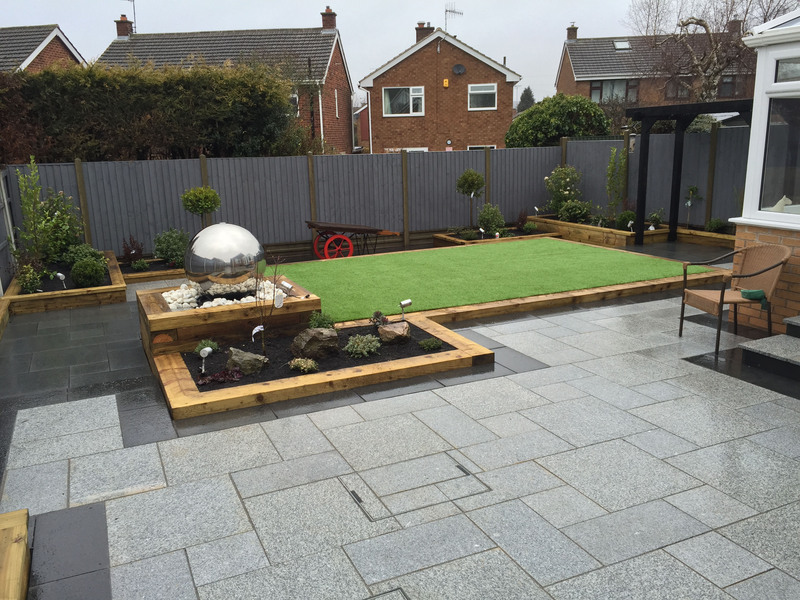 This garden showcases our Arctic Granite range in the best possible way, using all three of the colour options to provide exciting visual impact even in a medium-sized space. Our Arctic Granite paving has a subtle surface texture and superbly even colour, making it the perfect option for garden designs which require an elegant and clean solution. The three co-ordinating colours can be used effectively together or on their own. Glacier is an icy cool grey; Dusk a mid-charcoal colour; and Midnight a deep, rich grey. The meticulously cut edges of the Arctic Granite paving mean the stones can be laid with narrow joints, creating an almost seamless paved surface. For more information on Stonemarket product please contact 0345 302 0603. The final result for this Landmark garden certainly fulfils the original brief. It’s a beautiful balance between modern and historic style points, with the bold colour scheme of the co-ordinating Arctic Granite providing a perfect backdrop to each individual element. The split level planting helps the eye travel round the garden, while the multi-level paving and seating areas encourage you to journey round the garden itself and take in every view. The sparkling spherical water feature reflects the garden in its entirety, and provides a crystal-clear modern focal point. The railway sleepers, dark wood pergola and traditional symmetry of the borders give the garden a traditional, ‘country garden’ feel, providing a rich contrast to the rest of the space. Landmark have used the Arctic Granite paving in an utterly unique way, maximising each of the three colour options through judicious placement across each part of this contemporary garden. Mark Dewick was the lead designer on this garden, supported by the family team at Landmark. 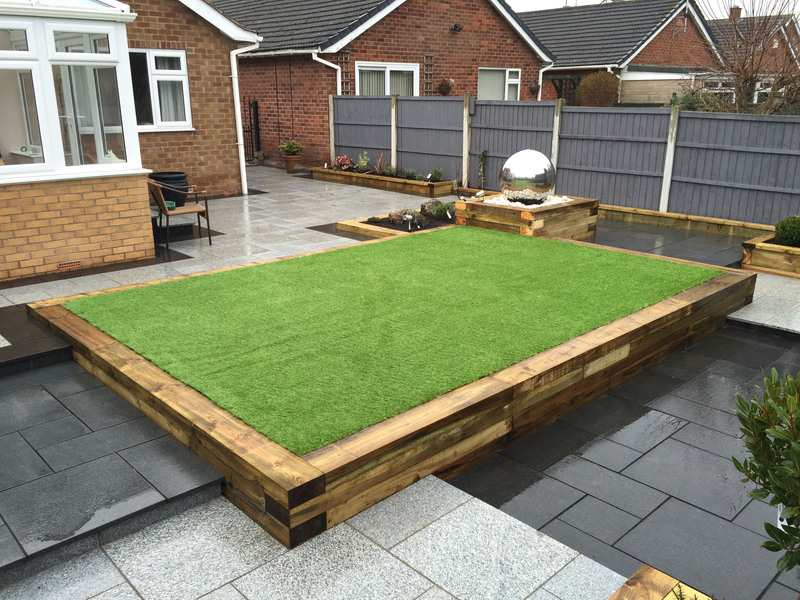 Based in Nottingham, Landmark provides a complete design, build and maintenance service for garden of all sizes. Their specialism is garden landscaping, often building exciting split level planters alongside robust decking and paved areas. They pride themselves on their ability to design, construct and maintain all elements of gardens, including unique water, decking and planting features.